The main material is pure natural plant fiber like bamboo powder, crop stalks, rice hull etc. 2. 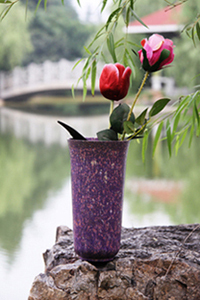 We have developed four series of products, such as flower-pot, tableware, home supplies, and pet pot products etc. There is a wide variety of styles and patterns to choose from. Our products also enjoy various attractive colors. Products can be customized with different specifications according to customers� request. 3. It is heat-resistant, waterproof, of high strength, non-flammable, non-fragile, non-toxic and non-smelly, It is harmless to human. 4. The products can be naturally biodegraded into organic fertilizer in the field after they are discarded. There is no harm and pollution to the environment. It can protect the environment and reduce the cost of waste disposal. 5. We can adjust production process and determine different periods of degradation by your request.